The Hon. 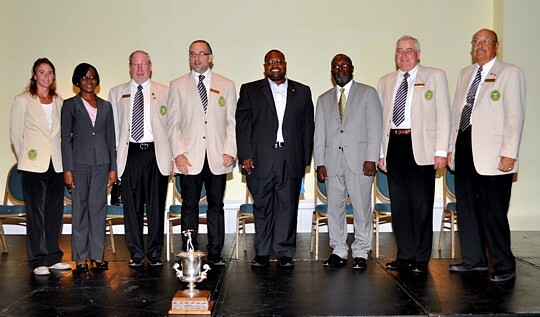 Charles Maynard, Minister for Youth Sports and Culture, officially opened the Caribbean Amateur Junior Golf Championships Wednesday evening at Grand Bahama’s Radisson Our Lucaya Convention Centre. This is the second time that Freeport is hosting the championships, the first was in 2001 at the Ruby Golf Course. It was also hosted in The Bahamas prior to that at the Paradise Island Golf Course. From left to right Karen Carvesbert, administrator CGA; Ginger Moxey, vice president, Grand Bahama Port Authority Group of Companies; Ambrose Guthro, past president CAGA; Carlos Elmudesi, vice president CGA; the Hon. Charles Maynard, Minister of Youth Sports and Culture; James Gomez, president BGF; David Byrd, secretary CGA; Cezal Rivcia, tournament director CGA. 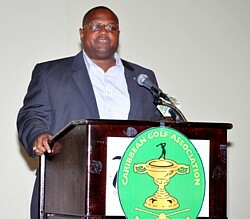 “I am pleased to have been invited to join you all today for this year’s Caribbean Amateur Junior Golf Championships,” said Minister Maynard. “I wish, at the very beginning, to congratulate all players for the high quality of golf that you would have played throughout the season to quality you for these Championships. Indeed, I am also encouraged to learn that this year’s entry includes players from our sister Caribbean countries including Barbados, Trinidad and Tobago, Cayman Island, USVI, Puerto Rico and the Dominican Republic, Jamaica. Charles Maynard, Minister of Youth, Sports and Culture. Mr. Maynard said these are the seeds of progress in the game that will bear fruit in the future to make The Bahamas and the region a source of world-class golfing champions. He said The Bahamas Government recognises the importance of sports in the promotion of self-discipline, good health, patriotism and regional unity.